Save our Earth and Save Money. Benya is concentrated! It makes 40 quarts or 10 gallons of streak free glass cleaner and keeps 39 plastic bottles out of the landfill. Save $260 over buying ready to use glass cleaners. Now that is a savings! Concentrated Benya is unsurpassed for all glass including black faced appliances, windshields, windows and glass furniture. Earth Friendly, industrial strength Benya removes stubborn film on vehicles windows leaving them and all glass surfaces streak free. Gentle enough for granite and marble countertops. For the ultimate windows, try our Benya. Streak free, Benya leaves such a remarkable shine you can't tell the glass is there. It removes film and oil that builds on windows and windshields. You even save money with Benya It's concentrated and makes 10 gallons of the best eco-friendly, non-streak glass cleaner you'll ever use. Why pay $260 for 10 gallons of glass cleaner when you can save over $200 when you use Benya. First clean your windshields with Benya to remove any smears or streaks. Apply a very light coat of Advantage to your windshield by pouring a very small amount of Advantage on our Baby Diaper Cloth Towels or a clean soft cloth. Apply too much and your windshields will smear. Advantage contains a polymer, which leaves the surface slick. It also gives your vehicle the protection against sun ray damage. That coating prevents the bugs from being able to bake into the glass making removal very easy and improving visibility when it rains. Ice and snow glide off easier as well. Green clean bathroom mirrors by using our Benya. Benya removes the dull film on glass and will not streak windows or mirrors. Need an extra bonus? Your bathroom mirrors will no long fog up when you shower! Benya is environmentally safe and one of the few cleaners gentle enough to use on granite and marble surfaces. Be sure to use a very clean cloth when working on these appliances. The grease and dirt on your cloth will cause them to smear. 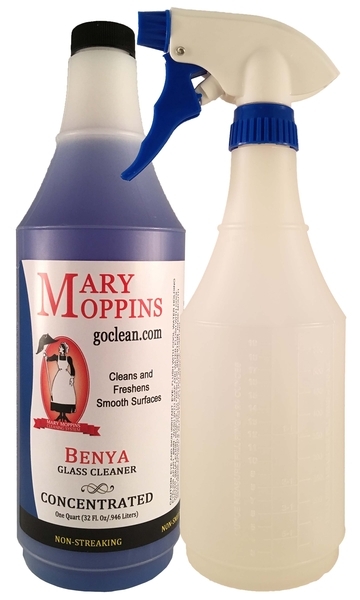 Our brand new and exclusive concentrated glass cleaner, Benya removes grease, smears and smudges. Spray it on then let it set several minutes. Benya will not streak or smear yet does an incredible job removing grease, dirt and fingerprints. Use one of our Swifter towels to wipe. Never spray a glass cleaner directly on glass if it is surrounded by wood framing. You will destroy the finish. For all glass furniture, spray our Lint Free Towel with our streak free window cleaner Benya and tuck that in a back pocket. Benya will not leave smears or streaks on glass or any surface. When you come to the glass table just whip out the Lint Free Towel, clean the glass and return the towel to your pocket. Our Swifter Towels are wonderful and safe for cleaning TV or computer screens. Green clean bathroom mirrors by using our Benya. Benya removes films and will not streak windows or mirrors and it prevents them from fogging up. Benya is environmentally safe and one of the few cleaners gentle enough to use on granite and marble surfaces. Never clean any window in the direct sunlight. Early morning or late evening is best. Any product will leave streaks in a window if used in direct sunlight. This is where our Window Wizard and our streak free Benya will outshine any other product on the market. First grab the durable and dependable Best Home Mop with extension handle that includes our Extension Handle and 9 inch cleaning head. Toss in our Angle Adapter the Window Wizard which are microfiber pads and Pad Holder then our Window Squeegee for the fastest most effective way to clean those windows outside. You will use just the Window Wizzard and Benya to clean the inside windows. Use an old but clean terry hand towel to remove the cobwebs both inside and outside the windows. Drape the towel over the Mary Moppins Mop Head The round mop head conforms to the curves of the windows and the edge of the mop head is wide enough to clean the edges of the metal bracing as you dust the cobwebs. Then with the towel still draped over the mop head, pull the towel down the center span of those bracings to clean them as well. You will love the convenience and be amazed how quickly that job is finished. Next tackle the outside windows. Never clean a window when the sun shines directly on the window. Doing so only guarantees smeared windows no matter how good your product. Attach the Angle Adapter to the Moppins Handle removing the Grip Tite. Then attach the Microfiber pad holder. Angle the adapter to the correct position to angle over the top of the windows. The microfiber pads come as a pair one washes and the other dries. Dampen the washing pad with water only then thoroughly saturate the window. It will scrub away all the bird residue, dirt etc. Then use the window squeegee to remove the excess water. Finish drying with the microfiber drying pad. The inside job: For the inside windows, use only the microfiber pads. Spray the washing pad with Benya. Wash the window and the dry pad for, of course, dries them. Our baby diaper cloth will also dry these windows. The angle adapter coupled with the swivel action of the pad holder makes cleaning these windows a breeze. The microfiber pads will work wonders on all your glass windows. The base of most glass tables in sun rooms are either wrought iron or wicker. Never spray a glass cleaner directly on these table tops. Spray our Benya directly onto our Lint Free Towel and wipe the table top. Dilute Benya 40 parts water to 1 part Benya. Pour 2/3 of an ounce in a 32 ounce spray bottle and fill with water. If your water is hard add 1 tablespoon food grade distilled white vinegar to soften the water for streak free cleaning.